Express your commitment and love for each other perfectly with this elegant 18ct white gold brides' 4mm flat court ring. A beautiful symbol to commemorate your special day. 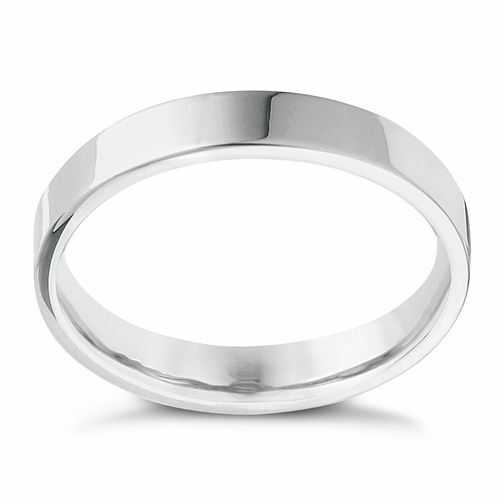 18ct white gold 4mm extra heavyweight flat ring is rated 3.0 out of 5 by 2. Rated 1 out of 5 by Anonymous from Dissapointing Very disappointed with this “extra heavy” wedding ring. Looks cheap and tacky and most likely it’s going to be returned. Rated 5 out of 5 by Anonymous from Excellent service Ordered the ring, believing that it would take some time to get it but it arrived just two weeks after I placed the order. Very nice ring and excellent service.